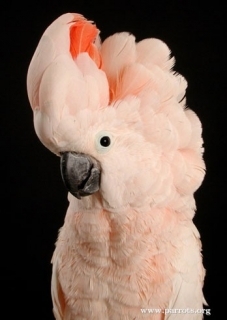 The Moluccan Cockatoo is found only on Seram and Ambon in Indonesia. Both adults large, soft peach coloured cockatoo with bright, dark peach crest; soft yellow suffusion underwings and undertail. Eye black, area around eye white. Eye black in male and dark brown in female. Shrill screech with quavering notes; are vocal most of all in evening. Small seed mix such as: canary, oats, safflower and small amount of hemp, spray millet, limited sunflower seed, dry, soaked or sprouted; sprouted beans such as mung or peas, cooked butterbeans or lentils, boiled or fresh corn, green leaves of spinach, Swiss chard, lettuce, sowthistle, dandelion and chickweed; fresh vegetables such as carrot, celery, zucchini, squash, green beans and peas in a pod; fresh fruit such as apple, pear, orange, banana, cactus fruits, pomegranates, berries, asian pears, kiwi fruit, and others; nutritionally complete kibble, high protein biscuits for underweight birds. Chewable objects - sterilized pine cones, fir, pine, willow or elder branches, vegetable tanned leather items; hard plastic puzzle items, food finders, push and pull toys, different size perches, socialization. Enjoys bathing so provide overhead misters or use spray bottle. 75cm (29") high, 60cm (23.4") in diameter, barrel shaped. Wild bird trade (baseline estimates suggest 4,000 birds are removed from the wild annually in domestic trade), deforestation and habitat loss. S Moluccas (Seram, Saparua and Haruku), Indonesia. Lowland forest between 100-1200m (328-3936 ft). Found in undisturbed and disturbed primary lowland forest with large trees, also open canopy forest with low vegetation. Feeds on nuts, young coconut, seeds, berries, and insects and their larvae. Found in noisy roosts, during breeding season found singly or in pairs; at other times found in groups of up to 16 birds. Generally shy species. Active early morning and late afternoon. 2 elliptical eggs, size 30.0 x 50.0mm (1.2 x 2 in).